Today's post is a follow up of Yesterday's post. 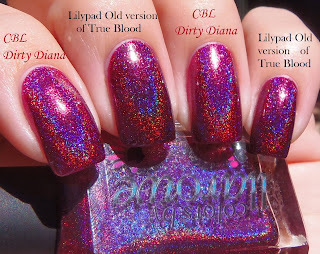 If you were thinking "I love Lilypad's Older Discontinued Version of True Blood", then you have nothing to worry about, because Llarowe has a great substitute for it. 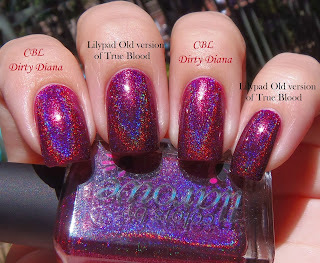 The formula of Dirty Diana was better than Lilypad True blood and dried much faster too. The holographic flame and the shade of red was virtually the same. I have first taken pictures of the comparison and then pictures of Dirty Diana by itself. These were taken on different days and on different times, so the colors may vary. 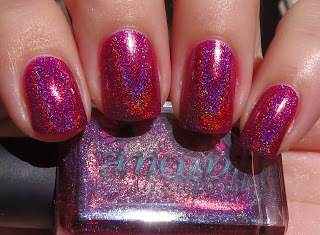 seems very unprofessional that Llarowe would dupe from a line she carries, quite shady actually. Thank you for this post, I wont be buying any Colors by Llarowe now! Actually llarowe couldn't have duped the original True Blood, because by Nicole's own admission, she never sent her the original version. She only had version 2 or 3 of True Blood. Yes she did. Check your facts. 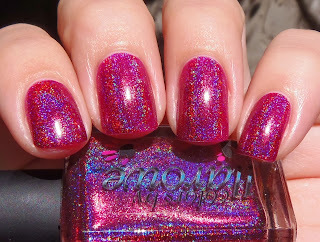 Holographic polishes involve making a color holographic. 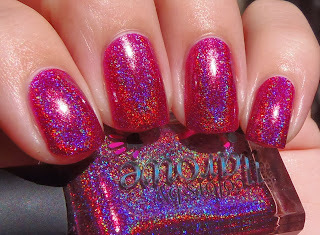 Last time I checked, no one currently selling any type of nail polish invented the rainbow. If someone thinks they exist in another dimension, they need to get a grip. 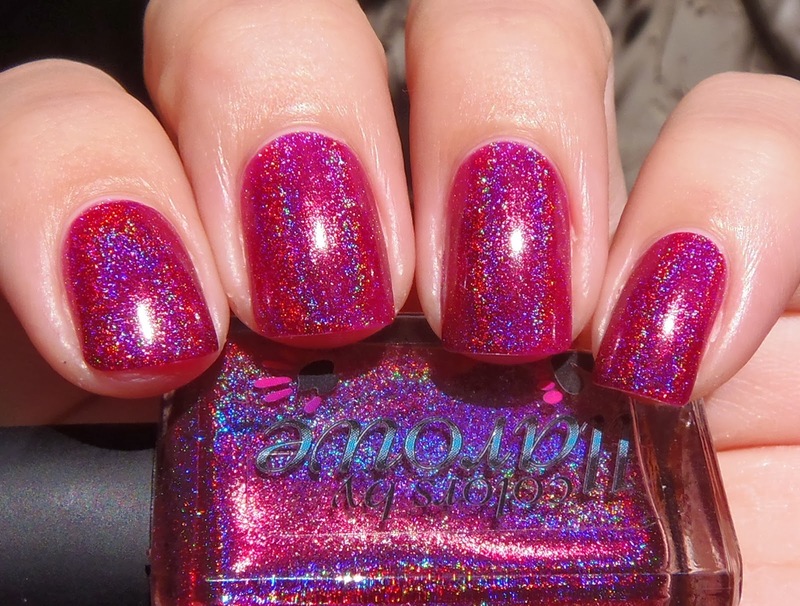 I'm referring to the COLOR of the base polish and type of holo. Considering the ruckus you've raised over the color not being able to be recreated as it originally was, please just concentrate on remembering your name. This is the last thing I will say. Learn from my mistakes. I used to get all upset about Lynnderella problems. It's just making you guys look foolish. Losing one customer is not good, but letting the inability to let something go lose you all that customer's friends is not worth it, ever. You might punish the complainers in the short term with insults, but in the long term it affects you when there is no brand loyalty because of the perceived behavior of their supporters. You can lose a lot of momentum arguing that is hard to build back up with positive behavior. Just my two cents. I am trying to figure out why there is drama on this post, seems like a simple comparison to me. I'm not sure if people realize this, but it is possible to come up with the same ideas without knowing. I love both and would buy both if I could. The amount of indies and colors is exhaustive, similar colors will be created. Yes, some dupes are intentional-- if the color is no longer available/affordable then that is an especially welcome intentional dupe.